Ed. note: This article, Combat Pistol Shooting, is written by Aaron, one of our long-time authors. 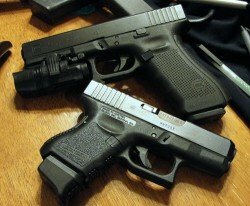 Here on Bluesheepdog.com Richard has already posted an article titled “Gunfights happen up close … except when they don’t”. In that article Richard explores a dangerous trend and philosophy of law enforcement firearms instructors to train officers to shoot without using a good sight picture. We at Bluesheepdog.com strongly advocate training that is real-life, and not just for punching tight groups in targets. My hope is to expand on the general thoughts of Richard’s article, and provide some of my own insight into a topic that apparently is becoming a highly debated one in law enforcement around the country. I fully agree with Richard’s quote, “speed is fine, but accuracy if final”. Did I leave anything out? Wow that is a lot of stuff, but in reality officers involved in a deadly force encounter will be tested in the majority of those areas. If we don’t train officers to be ready for the real thing, then as soon as Murphy shows up and their target moves (how dare they), or that target shoots back (my God! ), all that bravado from those tight groups on the range is going to go out the window and the officer is left with nothing to rely upon but instinct. I simply do not have the time or space here to cover each of the topics above. Over the next few weeks and months I’ll dive more deeply into some of those specific training areas. In the meantime I’m going to jump right into the shooting aspect of combat pistol shooting, with emphasis on proper shooting platform and sight alignment. I hope my thoughts here will help officers reflect upon the overall concept of combat pistol shooting in relation to officer involved shootings. I will also provide you my opinions on the concept of not teaching officers to use their sights in shooting situations. In my opinion training to be quick on the draw, and to fire quickly (often in a tucked into body position) is a critical skill to learn at the arm’s length distance or maybe 2 yard line (3-6 feet). This mimics a close encounter where an officer must push off to disengage a close deadly threat that may even be aggressing the officer. The officer must then be able to fire effectively in a situation that does not allow for the ideal extended and locked shooting position. With proper training AND expectations, officers should be able to place most of their shots in an acceptable upper center mass area of the target. If we don’t place expectations on our officers we ARE NOT training them, we are simply allowing them to shoot free bullets. Not using sights at this distance is a reality of the close encounter. This is also a shooting technique to give the officer the best advantage of putting rounds on target without becoming involved in a gun retention maneuver with the suspect, who might reach out and grab for the officer’s sidearm otherwise. UPDATE 03/29/2017: An officer at my department was dispatched to a disturbance involving an adult step-son and movers (friends of step-mom). Step-son did not want to move after his father had unexpectedly passed away. The officer parked a few houses away and awaited back-up following good safety procedures. However, while waiting the movers came into the front yard yelling at the officer about the step-son being armed with a knife. The officer contacted the movers, and instructed them to stay away from the house while back-up responded. However, the movers advised the step-mom (friend) was still inside the house, and they were going back in if the officer did not. While trying to convince the movers to move away, the step-son emerged from the house armed with a 10-inch butcher knife and aggressively approached the officer. In the course of less than 3-seconds, the officer warned the step-son twice to drop the knife, drew to the tucked position, and fired one shot hitting the step-son in the upper chest. The step-son was hit at a distance of about 6-feet and would ultimately die from his injury. Training for close quarters engagements, including a good tucked shooting position is a standard part of our firearms training program, and absolutely saved this officer’s life. During the first few shots on target, officers should be trained to tactically create distance from the threat, while firing more shots that are now coming from an aimed and proper shooting platform. 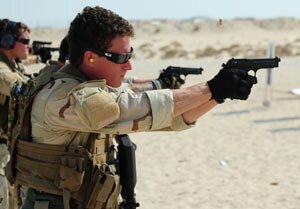 Shooting on the move – even backing away – is an absolutely critical component to effective combat shooting. A moving target is harder to hit. When we successfully train officers to multi-task during stress shooting we gain the benefit of opening their peripheral vision so they do not become target fixated. Their shots are often better as well. At this point in the gunfight the focus is for the officer to draw and fire on target. Some leniency in shot placement can be afforded in the first shot or two. Meaning if the first shot or two are in the pelvic girdle or abdomen that’s acceptable because our ultimate goal in this early stage of the gunfight is simply to get shots on a danger close target as soon as we can. Any shots outside of the upper torso (with hips included) require corrective training to get onto target. Our quick and decisive action should jump right into the OODA Cycle of our adversary, and start to turn the advantage in our favor. Recognizing shot placement and effectiveness are critical skills in combat shooting. After the first shot or two officers should be adjusting or hopefully reverting to muscle memory and placing any further shots into the upper center mass area of their threat. *** So the training concept here is to draw as quickly as can be done effectively, quick fire from the tucked position to get the suspect off of the officer, and then extend and lock out the shooting stance AS officers create distance to place more accurate fire on target using their sights. The movement away from the threat should start almost immediately after the first tucked shots take place. Fire accurately to the stop areas of the suspect (upper center mass, head, pelvic girdle). In regard to any criticisms about the “21-foot Rule” I’ll let the experts speak in the article posted at PoliceOne.com from the FSRC. Yes, being within 21 feet of an armed suspect is a dangerous place to be, but with proper training and mindset, it is still a winnable situation. And just being within 21 feet does NOT justify the immediate application of lethal force by the officer. Obviously if the suspect is rapidly approaching the officer a proper shooting platform and sight alignment may not be possible in time. Officers may have to revert to the danger close method described above. Proper “combat” training should emphasize an officer’s need to create distance, and find cover – all at the same time they are drawing, extending, acquiring, and firing! Moving “off the X” must be emphasized! However, if our adversary is engaging the officer from those medium distances, it will be critical for the officer to place accurate fire to stop the threat. Proper shooting platform and sight alignment is necessary for this to happen. I feel I need to touch briefly on this topic. In labeling this “combat” shooting I hope all of us realize that soldiers and police officers have entirely different motivations for firing their weapons. The combining of “combat” in the training philosophy here is ONLY meant to relay that in a gunfight, survival often plays out in the “combat” training and execution of the officer. During war, American soldiers are given Rules of Engagement (ROE). As long as they comply with these rules the firing of their weapons towards the enemy, is completely accepted and usually encouraged. Occasionally bullets fired by American soldiers go to unintended places. Being the benevolent country that we are, we may pay out some money for “collateral damage” sustained during war, but the military moves on. In police work, the ultimate goal is to stop the offender and bring them to trial. That is our concept of justice. As such, police officers are placed under an incredibly more difficult set of rules than soldiers. Where a soldier can “snipe” an enemy, officers are most often required to warn of the threat of lethal force (when reasonable). Where a soldier’s intent is to kill or injure the enemy so he can no longer fight, the police officer only uses lethal force as a last resort to stop a lethal threat and to seize the offender. Sometimes that offender dies as a result, but they have been “seized” non-the-less according the the U.S. Constitution. Under such constraints officers are required to account for all of their rounds fired. A soldier is not. So no one reading this article should take away anything that supports officers firing at random, like a “spray-and-pray”. On the contrary, the point of advocating proper shooting platform (stance), and sight alignment is for the very purpose of accounting for every shot fired at an offender. Officers should always operate under the “Know your target and beyond” safety rule – even if it means that they can’t fire on a lethal threat because of innocents near or behind the threat. However, when the opportunity arises, and the lethal threat still exists, good shooting fundamentals should be used to accurately end the threat. To teach officers to “never” look at their sights, or to only shoot at targets that are close, is a very dangerous trend in law enforcement. 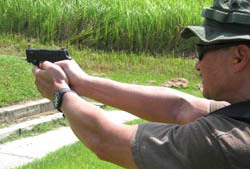 Point and shoot techniques can be a great tool to advance officer’s overall shooting competency, but in the end we must also enforce sight alignment. To not do so will ultimately lead to shots off target, which opens officers to civil and criminal liability. Any Department that willfully teaches the concept of shooting without sights might as well fill out a blank check. By the 10 yard line and beyond officers should still train to draw and extend as quickly as they can proficiently do so, but then they should be trained to take advantage of distance and dial in to the full sight picture for the most accurate shots. I’m not sure who said it, but my firearms instructors have hammered the concept that, “We need to learn to slow down in a hurry”. Another saying goes, “slow is smooth, and smooth is fast”. These tie right in to the concept of “Speed is fine, but accuracy is final”. For officers not to be trained to accurately fire their sidearms at distances beyond 10-15 yards is woefully negligent. For years I was trained that a 50 yard pistol shot was at the maximum range of the weapon and should only be done in the most extreme of circumstances. Accordingly, we only fired our pistols a few times at the 50-yard line – and not for qualification. Of course we were firing S&W 4566 pistols in .45 ACP at the time, but I digress. Then I experienced the epic un-winnable “Academy Call”. Long story short, a large-scale meth cook placed a Claymore mine in his 2-car garage-sized lab, consumed some meth, armed himself, and attempted to escape. Bad guy detonates the Claymore, and takes off on foot after shooting at detectives with a Glock 19 loaded with a 33-round magazine. The explosion blew half the garage roof off and started a massive chemical fire that fully engulfed the house in flames over 100 feet high in about 3 minutes. Initial gunfight was about 25-30 yards separation. He ran to a broken down Jeep Wrangler with 2 partially flat tires to flee. Two detectives had continued to engage the bad guy with their pistols when he reached the Jeep – about 100 yards away. One had a 1911 in .45 ACP, and the other had a Glock 22 in .40 cal. One fired from standing and another from kneeling. When the Jeep was examined later, there were 5 hits from the pistol rounds (out of about 12 shot from that position). Shots involved proper shooting platform (2-handed, extended and locked) and a good sight alignment. The detectives also paused to reacquire their sights between shots. Obviously the field, on a hill, with a forest on top provided the ideal safe backdrop for this shooting, but the point is the pistol rounds hit near their target. One of the rounds hit the top of the driver’s door opening, another on the bottom of driver’s door opening, and yet another traveled through the open driver’s door opening (doors had been removed), and struck the windshield from the inside. Train like you fight – a long pistol shot may be the only one you have to try to stop the threat. Do I think we need to start training officers to shoot at 100 yards with their pistols? No. However, if we train out to 50 yards, and EXPECT them to make good upper torso hits, then the confidence they gain from that experience could reasonably pass on to somewhat longer shots if that dreadful day presents itself to them. I’m a firm believer in the patrol shotgun and the patrol tactical rifle, but in a pinch let’s teach our officers to be ready to lay down some accurate “longer” distance shots with their pistols. Otherwise we leave them in a situation where the bad guy dictates the outcome – and we all know where that ends! In conclusion, danger-close distances require modified shooting techniques. The tucked (unaimed) shooting position has many advantages and logical support for its use. However, as we start to create distance we should hammer into the officers the need to bring the sights to bear, and take up a solid shooting platform. Shots will be more accurate, it provides the officer a better sense of control during the gunfight, and it protects us from the liability of errant shots. In all things related to combat pistol shooting we need to train our officers to “Get off the X” and MOVE!